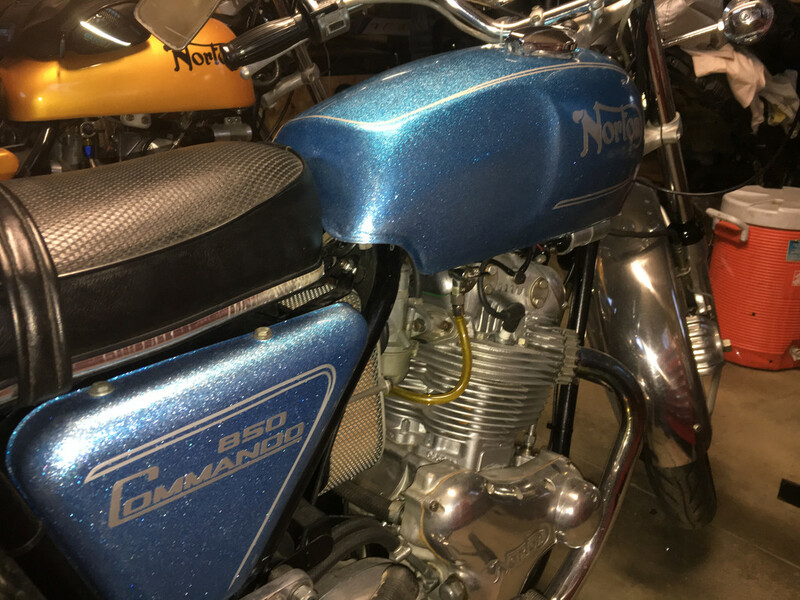 Discussion in 'Norton Commando Motorcycles (Classic)' started by MichaelB, Apr 15, 2019. Not sure if this is old news or not. I found this website interesting. I'm not sure if Norton used this brand of metal flake or just coincidentally the same description. I doubt either company has copyrighted the name. I used flake from Luxe Liquidation on the Titanic's tank and sidecovers. Your bike looks nice Danno. Not sure how many 'Flake' suppliers are out there. Thought it interesting they had most of the Commando colors. Looks like with a little fiddling, one could get really close. Thanks, Michael. There are quite a few suppliers but you are on your own to match 1970's factory gelcoat flake. Mine was a lot closer in the bag but multiple coats of flake-infused clear and wetsanding between coats lightened the shade a bit. I have seen flake close to most of the factory Fireflake colors, blue, green, silver and red, but the bronze looks most difficult to match by eyeball. Pros like the Vintage Vendor seem to have no problem. Go to Ranger boats and get their repair paint products? The flakes in the Norton fiberglass body parts, were often colored, and that's why its hard to reproduce the look with just silver flake.